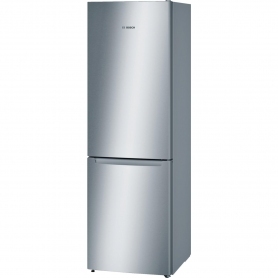 This freestanding Bosch fridge freezer has stainless steel look doors and an impressive capacity, making it a stylish and practical appliance. A total net capacity of 302 litres, with a 70/30 split between the fridge and freezer, makes the Bosch KGN36NL30G ideal for families that enjoy fresh food. This appliance comes with removable door seals, making it much easier to clean. The fridge compartment offers 215 litres of usable space for your chilled food, split across four glass shelves and a MultiBox. Three of the shelves are removable and height adjustable, allowing you to modify the compartment to your needs. Plus, all four shelves are spill-proof, so you don’t have to worry about liquids leaking onto the shelf below. The MultiBox has a wave base, designed to keep your fruit and veg fresher for longer, while four door compartments offer extra space for your bottles and condiments. There’s also Multi Airflow technology in the fridge to ensure an even temperature. Small fans move cold air constantly, which helps foods retain their flavour for longer. In the freezer section, you’ll find a net capacity of 87 litres split between two transparent drawers and an EasyAccess freezer box. This box is an open-ended shelf that gives you quick access to frozen food without opening the drawer – ideal for storing your most popular items. If you want to freeze your food extra quickly, you can turn on the Superfreeze option, which switches off automatically when needed. A fridge freezer is one of the few kitchen appliances that’s on 24 hours a day, which means it needs to be energy efficient. The Bosch KGN36NL30G has a number of features to keep energy consumption as low as possible. NoFrost technology removes humidity from the air and prevents ice forming inside the appliance. This means that less energy is used to maintain the correct temperature in both compartments. Plus, you won’t need to worry about ice taking up freezer space. An electronic LED temperature control panel ensures easy and precise selection, while the LED light in the fridge lights up the compartment. LED bulbs also use less energy and generate less heat than standard bulbs. Thanks to these energy saving features the Bosch KGN36NL30G has a great A++ energy efficiency rating, helping to save you money on your bills and the environment. 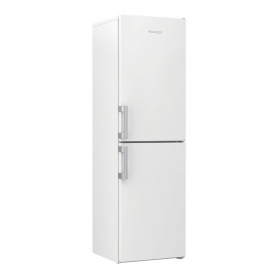 The Bosch KGN36NL30G is a stylish, energy efficient and practical fridge freezer. Order yours today. Additional Information Requires 5mm clearance on either side of appliance.